This delightfully-light, fresh, and floral scent features calming lavender and green tea with lemony top notes of refreshing May Chang. This wonderful blend of the purest essential oils combines beautifully to create a restful and soothing fragrance that will bring the perfect ambience to your home. French lavender is the ultimate natural relaxant, caring for and nurturing both body and mind. Ease the stresses of the day with this familiar scent, which melts away anxieties, restoring and revitalising you while also helping to promote a good night’s sleep. May Chang, sometimes called ‘Litsea cubeba’ or ‘tropical Verbena’, has a spirited, intense fragrance with spicy and fruity undertones. This addictive scent evokes happy memories of visits to the sweet shop as a child, where delicious sherbet lemon treats could be bought in a small paper bags and treasured. Slightly akin to lemongrass but far sweeter and more refined, this prized scent is used extensively across the perfumery, flavour, and cosmetic industries. Finally, the refreshing scent of green tea perfectly balances this precious blend. Green tea is also used extensively in perfumery and cosmetics, both for its aroma and its ability to relax and soothe. Each of our pure essential oils is carefully sourced and blended with an alcohol-free base, and comes in our natural reed diffuser—the perfect way to fragrance your home naturally. 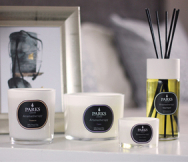 Presented in a stylish white gift box with a luxe feel, this exceptionally high-quality 100ml diffuser uses natural reeds to fill the room with its exquisite aroma. A truly superior gift for a discerning and house-proud individual who appreciates fine fragrances.